Tristeca nuda (L.) P. Beauv. ex J. St.-Hil. Nudum In Latin, means "bare naked." Its English name derives from time past, when a handful of the branches are tied together to make into a small broom. 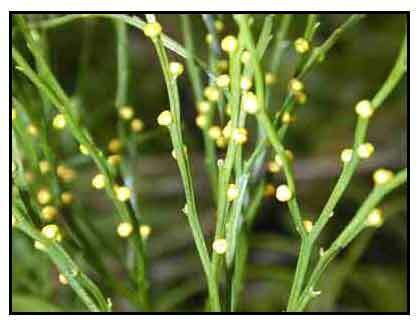 Psilotum nudum is a herbaceious, rootless, perennial, terrestrial or epiphytic fern with branched creeping rhizomes. Stems are two-forked. Forked branches are slender, green, flat , triangular fruiting with minute pointed scale-like leaves. Spore-producing organs consist of three fused globular capsules in the forks of branchlets. - In the Philippines, found in forests at low and medium altitudes, in rockwalls and cliff crevices, and tree trunks. - In gardens, usually attached to trunk of tree ferns or dead trees. - Occasionally planted in pots or hanging baskets. - Widely distributed in the tropics. - Plant yields flavonoids and sugars. - Leaves reportedly used for making tea. - Spores used medicinally as a purgative. - In Hawaii, spores collected and used like talcum powder, under the loincloth, to avoid chafing. Also used in making of leis.